A few days ago I posted some stamp images (Chiloé mythology) one of which depicted “Pincoya”, the mermaid of Chiloé Island. In today's post, I will describe her, and other mermaids that, according to the natives' myths, lived in her lakes and by her shores. Father Diego de Rosales’ wrote in the late 1600s that the Chilean town of Serena (not in Patagonia) was named so because a mermaid (“Sirena” in Spanish) had been seen there. a beast that came close to the shore, which surging out of the water displayed a head, face and woman’s breasts, with long fair and loose hair or mane. It carried a child in its arms. When it submerged they noticed that it had a tail and back of a fish, covered with thick scales like small shells. However Pincoya and Sirena were different kinds of mermaids. Vicuña Cifuentes noted that “Sirena is a sea and lake/pond creature, where she has been seen combing her golden and abundant hair with a golden comb”. Pincoya on the other hand lived exclusively in the sea. Pincoya, who was also fair haired, had a husband (or brother according to other sources), Pincoy and together they promoted the abundance of sea fish and shellfish where they lived. Both husband and wife were good natured and only got angry with those fishermen who overfished–role of protector/owners of the waters. She was daughter of Millalonco and sister of the Mapuche mermaid Sumpall (more on her below). Millalonco was the outcome of the mating between a sea lion and a woman at the dawn of time and he inherited his father’s aquatic realm and became overlord of the sea and certain lakes, a veritable Mapuche Poseidon; he was also known as “Epuange”, because he was a two faced monster. Wise and generous, this water demon (“coheucufú”) was loved by the natives. John Byron, grandfather to the famed poet, was midshipman on the ill fated HMS “Wager” which was shipwrecked on Wager Island in 1741. One night we were alarmed with a strange cry, which resembled that of a man drowning. Many of us ran […] towards the place from whence the noise proceeded, which was not far off shore; where we could perceive, but not distinctly (for it was then moonlight) an appearance like that of a man swimming half out of the water. The noise that this creature uttered was so unlike that of any other man they had heard before, that it made a great impression upon the men. 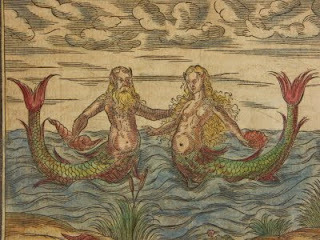 Although Sumpall was described by the natives as a water dwarf, in her femenine version, she was also represented as a beautiful mermaid half human, half fish. Sumpall is the Mapuche equivalent of the Chilote's Pincoya; she even had long flowing fair hair like Pincoya. Furthermore she was said to be her younger sister. Sumpall's character was volatile for she could be benevolent or wicked; she sometimes kidnapped evil people and, as a guardian of nature, hurt those who damaged rivers or lakes. Her fair hair perhaps reflects the gradual acculturation of the Mapuche under Spanish rule, as it is an exclusively European feature. She was also known as the “lake’s maiden” (Coñi Lafquen). New Today. 07.10.2010. more information on the possible Peruvian origin of Pincoya. Also, a possible link to a cryptid Chilean Sea Cow, or manatee. De Rosales, D., (1877). Historia general de el Reyno de Chile. Valparaiso: El Mercurio. v. i, ii. v. 1. pp. 308- 309. Vicuña Cifuentes, J., (1915). Op. Cit. pp. 83 and 87. Citing: Cavada, F., (1914). Chiloé y los Chilotes. Santiago: Imprenta Universitaria. pp. 101-102. Byron J., (1996). Naufragio en las costas patagónicas. B. Aires: Ediciones del Sol. pp. 63. Alvarez, G., (1969). Donde estuvo el paraiso, del Tronador a Copahue. B. Aires: Ed. Pehuen. pp. 299.